Pour lire en français cliquer sur la flèche à côté du mot ‘anglais’. To make a booking enter your check in and check out dates, the number of nights and the number of guests. Availability will be shown for each room type. To confirm a booking we require valid credit card details (Visa or MasterCard) as our guarantee. We may request the bank for credit card authorization, although no payment will be taken other than in the case of a late cancellation or a 'no-show'. We can also take payment in cash or by EFTPOS. 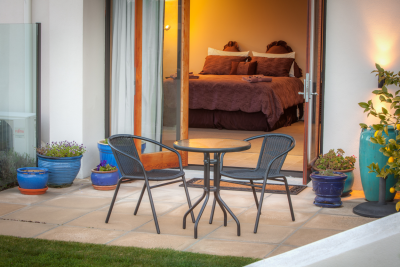 For cancellation within 10 days of arrival you will be charged for one night's accommodation. For cancellation within 48 hours or for a 'no show' 100% of the total will be payable. Check-in: from 3pm or earlier on request if the room is available. 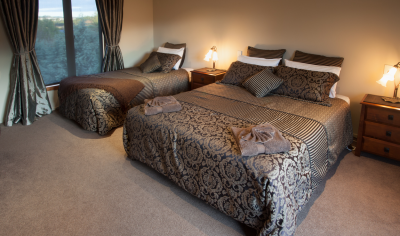 - Room with king double and king single beds - suitable as a double/twin or for a family group when combined with the Queen. - En suite bathroom, bedside tables, TV. WiFi. - Breakfast and daily room servicing included. - Adjacent off-road parking & independent access. 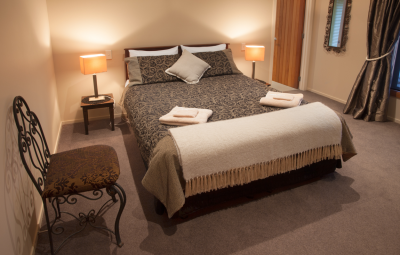 - Room with queen-sized bed and bedside tables. Suits a couple or single. - Ensuite bathroom, desk and free Wifi. 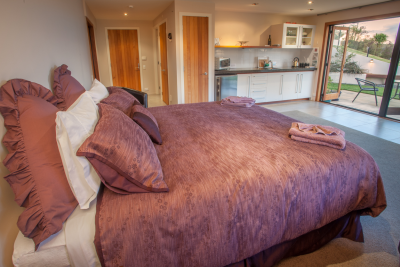 - Access to fridge and tea/coffee making facilities. - Tariff includes breakfast and daily room servicing. - Independent access and adjacent parking. - Breakfast optional ($20-25 per person). If you cannot find the dates you require please send us an email or call us. We will be happy to advise you.